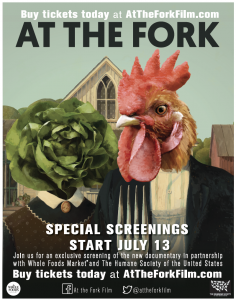 Whole Foods Market and the Humane Society of the United States teamed up with the filmmakers behind the new documentary At the Fork to bring a private screening of the film to Phoenix’s AMC Arizona Center 24 on July 13. This showing is part of a nationwide crowd-sourced* effort to spark a national conversation about how animals are raised for food in America. This documentary provides a transparent look into the complex world of animal agriculture – including the challenges and opportunities that exist within the current system – and shows how consumers’ purchasing decisions can directly impact farmers and how they raise their animals. In “At the Fork,” omnivore filmmaker John Papola and his vegetarian wife, Lisa, go behind the scenes to learn how animals are raised for consumption in the U.S. With unprecedented access to large-scale conventional farms, Papola asks the tough questions behind every hamburger, glass of milk and baby back rib. What he discovers are not heartless industrialists, but America’s farmers— real people who, along with him, are grappling with the moral dimensions of farming animals for food. Through conversations with experts on food, farming and animal husbandry, including world-renowned animal welfare expert Dr. Temple Grandin; Wayne Pacelle, president and CEO of The Humane Society of the United States; and Mark Bittman, bestselling author and former New York Times columnist, “At the Fork” spotlights the power consumers have to help change the way animals are raised. To purchase tickets, and for additional information, visit: www.AtTheForkFilm.com. *“At the Fork” is being screened nationwide through a crowd-sourcing platform that helps small, independent filmmakers bring their work to the big screen. The model allows individuals to register to host a screening or attend a scheduled screening at participating theaters. Theater screenings will be confirmed as minimum ticket thresholds are met.